Fully virtualized Cloud RAN is being held back mostly by the lack of interoperable standards. The standards that exist, for instance in front haul, are controlled by a handful of players, who have no vested interest to make them fully interoperable, instead they place proprietary flavors on them keeping prices high. This is one of the main things preventing C-RAN from happening earlier, and most shipments will not start until this has been ironed out, a process that could take another 3 years before shipments break the 3 million a year barrier. 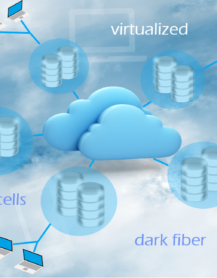 As a result centralized and virtualized macrocells and microcells will be deployed at a compound annual growth rate (CAGR) of 23% between 2017 and 2025 and although these will overtake new deployments of conventional cells in 2019, most of these deployments will still be centralized rather than fully virtualized. 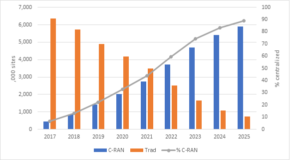 Once operators start to deploy RAN VNFs, usually conforming to ETSI NFV specifications, there will be a sharp acceleration of growth in the number of Cloud-RAN sites, from 2020. There is now a major dilemma for operators between simply using Centralized-RAN or going for a fully Virtualized RAN. The former is simpler and delivers some efficiencies; the latter is very difficult and disruptive to implement, but we believe will revolutionize cellular economics. Full Cloud-RANs will remain rare until mid-2020. The two key barriers have been availability of fiber and the vendor stranglehold on the CPRI (Common Public Radio Interface) interface. That has meant most early C-RANs have had to be very localized. It is essential that new emerging standards, preferably from the IEEE, take hold to open up the ecosystem and accelerate adoption. Operators which support full Cloud-RAN will have a far easier, cheaper task to implement 5G. However, the process of virtualizing the RAN may delay 5G upgrades. By 2025 we shall see the start of the fully hosted RAN – virtualized on a third party cloud (a vendor’s or perhaps Amazon’s) and this will transform the economics and power base of the entire mobile industry. 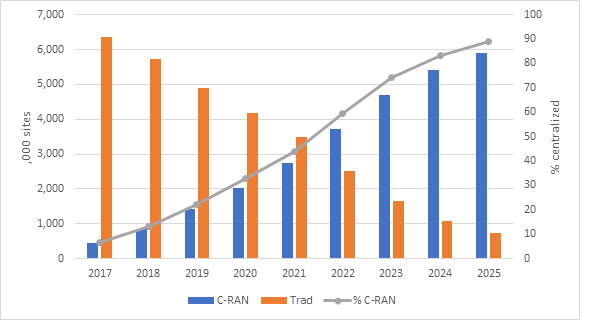 The biggest barriers to all types of C-RAN are related to fronthaul, mainly the availability of affordable, high quality fiber and the need to use the CPRI interface, which has been controlled by a small group of vendors, which implement it in semi-proprietary ways. 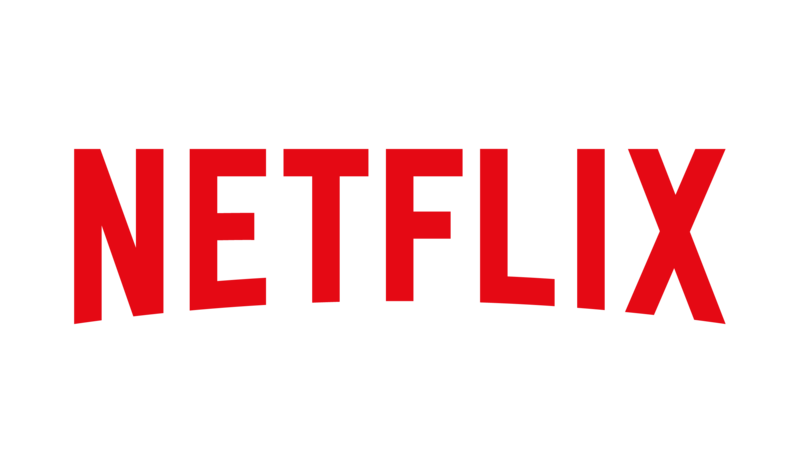 This raises high barriers to entry for alternative equipment providers, such as those supported under the Facebook Telecom Infra Project and threatens MNOs with lock-ins and high prices. It also makes many C-RANs economically non-viable because of the high cost of low latency fiber and CPRI. So far C-RANs have been relegated to the indoors, such as arenas and airports, using shorter fronthaul or mid-haul links, which use Ethernet. The right way forward is the release of cheap dark fiber, and so far this has only happened in Japan. Some other countries, such as the UK, are even trying to get by on copper-based technologies such as G.fast. We expect copper to grow from 4% to about 16% of fronthaul connections between now and 2022, and then to decline as fiber emerges. The bulk of long range fronthaul will be on fiber and the main change will be the rising use of dark, rather than leased, fiber as operators acquire the skills and tools to light up the fiber themselves. 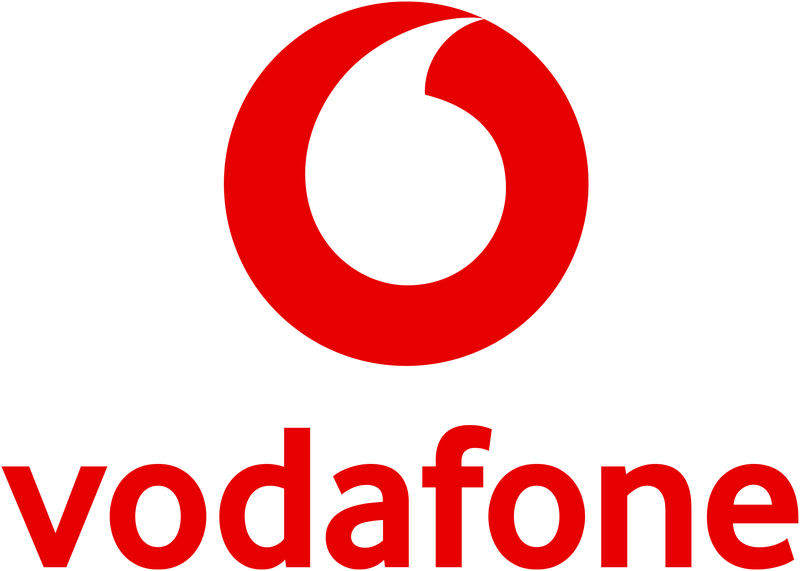 This report is critical to anyone involved in network planning or long term technology strategy for cellular networks, as well as partners, implementers, equipment suppliers, software providers and investors, at C Suite level down to product marketing and product planning. The RAN Research arm of Rethink Technology Research is essential reading for anyone who wants to stay on top of current trends and thinking among tier 1 and tier 2 MNOs across the globe. It’s like being a fly on the wall in one of their planning meetings.